Seneca's Letters to Lucilius are a rich source of information about ancient Stoicism, an influential work for early modern philosophers, and a fascinating philosophical document in their own right. This selection of the letters aims to include those which are of greatest philosophical interest, especially those which highlight the debates between Stoics and Platonists or Aristotelians in the first century AD, and the issue, still important today, of howtechnical philosophical enquiry is related to the various purposes for which philosophy is practised. 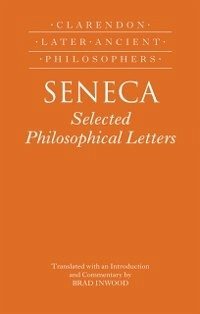 In addition to examining the philosophical content of each letter, Brad Inwood's commentary discusses the literary and historical background of the letters and their relationship with other prose works by Seneca. Seneca is the earliest Stoic author for whom we have access to a large number of complete works, and these works were highly influential in later centuries. He was also a politically influential advisor to the Roman emperor Nero and a celebrated author of prose and verse. His philosophical acuity and independence of mind make his works exciting and challenging for the modern reader. CLARENDON LATER ANCIENT PHILOSOPHERSGeneral Editors: Jonathan Barnes and A. A. LongThis series is designed to encourage philosophers and students of philosophy to explore the fertile terrain of later ancient philosophy. The texts range in date from the first century BC to the fifth century AD, and will cover all the parts and all the schools of philosophy. Each volume contains a substantial introduction, an English translation, and a critical commentary on the philosophical claims and arguments of the text. The translations aim primarily at accuracy and fidelity; but they arealso readable and accompanied by notes on textual problems that affect the philosophical interpretation. No knowledge of Greek or Latin is assumed. Brad Inwood is Professor of Philosophy at the University of Toronto.